I’m super biased, I know, but to be honest your photographer is probably the best person to ask, even better than your planner. Planners, as helpful as they are, are actually not often great at creating a timeline. In my experience, they draft it so late in the game that invitations have already gone out and no changes can be made. The original draft to your timeline needs to be created months in advance to allow for adjustments, not a few weeks before the big day. They also don’t know how much time your photo & video team will need to properly (key word here) document the day, and often give a very tight schedule that makes it very difficult for your creative team to be, well, creative. An experienced photographer with a good number of weddings under their belt will know things no one else (except your videographer) will know. They will have light in mind, and that is HUGE when it comes to the final result in terms of photos. Chances are a pretty big part of your budget is going toward your images, so it’s probably a good idea to work closely with your photographer to get to best results possible. When all is said and done, all those products and services you purchased for the day, all the details you spent so long choosing will be gone, but they will live on in the pictures. Alright, step 2 is choosing your ceremony time. Are you doing a First Look? Will you be having an indoor or outdoor ceremony? Will you do your family portraits before or after it? Do you want those in natural light? Are you wanting any sunset photos? 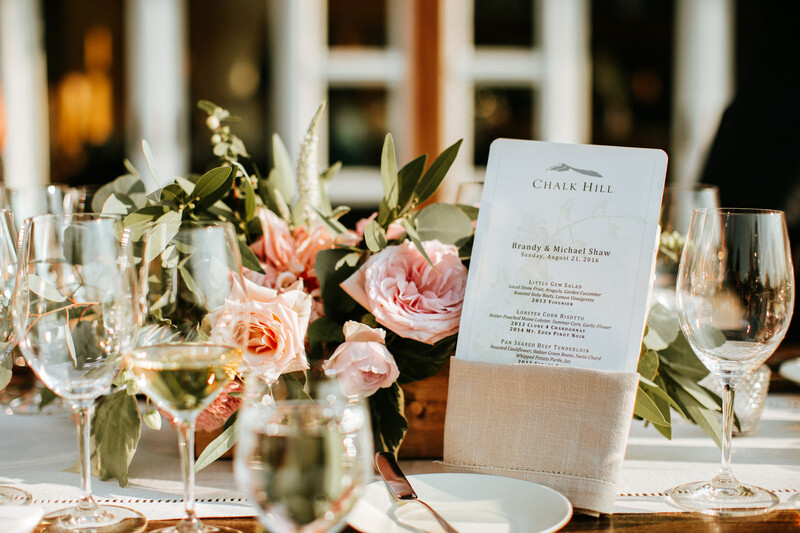 This is another reason to work closely with your photographer before you even choose a ceremony time, because they will be able to guide you through these questions. I can’t tell you how broken-hearted I was the day one of my lovely brides came to me wanting to do natural-light photos after the ceremony, but the ceremony was taking place a half hour before sunset. She wanted nothing more than to move it up but invitations had already gone out. By the time the ceremony ended the sun was completely gone and we had to use flash. Time is your friend on this day! I can’t stress this enough. Many people are tempted to rush the timeline so everything can “fit” in as little time as possible. Look, I get it. Time is money. But trust me you don’t want to rush this one. First and most of all, because you don’t want to be stressed that day. When you envision your wedding day, what do you see? You likely picture yourself and your loved ones interacting, smiling, laughing, making memories and that is exactly how it should be. You probably don’t picture yourself stressed out, worried and watching the clock the whole time. Spending the day wondering what time it is sounds pretty miserable and not at all what it’s about! So allow yourself the time needed for things to not be rushed. With so many people at play, how will you know how much time each portion needs though? Well, that’s where good communication is key. Ask each vendor how they like to work and how much time they each realistically need to get their portion of the day done. Then run all of that by your photographer again, because this too will impact when certain photos are taken. For example, if you want photos of the ceremony site completely done and undisturbed (before guests come in and move things around) then your photographer will need a little bit of time after florals and other décors are done, but before guests are let in. Now that you have a ceremony time and you’ve found out from all vendors how much time they each need to work, all you have to do it put it together. The typical anatomy of a (Western) wedding is: Prep, bridal party portraits, first look, couple portraits, ceremony, family portraits, cocktail hour, and reception. (And if you don’t want a First Look: Prep, bridal party portraits, ceremony, family portraits, couple portraits, cocktail hour, reception.) If you’re not having everything at the same spot, then don’t forget to consider how much time it takes to get to each location, and please, for the love of coffee, add some extra time to account for traffic!! Don’t account for the exact travel time Maps gives you, because it can vary greatly from day to day and hour to hour, not to mention the possibility of inclement weather or God forbid, an accident. Can you imagine how stressed you would be if you were stuck in traffic and running late on that day? Another place to be generous with is prep time. Ladies always need more time than men and the more ladies, the more time you’ll want to add. Finally, more time for family portraits than you think you will need. After the ceremony family members just love to scatter, and we’re for sure going to be spending time just trying to herd everyone lol. > SO 8HRS? 10HRS? 12? WHAT’S THE NORM? If you’re wondering what the typical amount of time is, it usually falls somewhere between 8 and 12 hours. In the end, though the structure of each wedding is roughly the same, the amount of hours needed is going to be subjective to your day. It will change based on how many locations there are to go to, how many family members/groupings there are to photograph, and how many “events” there are during the day (e.g. Are you having a specific send-off?) If you are having a sparkler exit and want that documented, then you’ll want your photographer there ’til the end. If not, it’s probably okay for your photographer to miss the last hour of the reception, as long as plenty of dancing and each event (dances, toasts, cake cutting) has been documented. Yes! Don’t skip any parts! Some couples think “I don’t need photos of prep time.” While it might not seem like an important part to document, it is actually a very big part of the narrative (and yes, even the groom prep should be documented.) When you wacth a movie, by the time the climactic scene of it happens you’re pretty invested in the characters and their stories, right? You’ve been watching their journey to it, that’s why that big fight scene or that moment when those two people finally come together is so emotional. If the movie consisted of only the “big scenes” it would feel pretty hollow. Well it’s the same with telling the story of your wedding day. In order for the viewer (you, your friends, your family) to feel connected, to be moved by the story, they need a beginning, a middle and an end. They need the whole story. Not only that, but as insignificant as those portions of the day may seem, moments are still happening during them. People often tear up during prep time, as they watch you get ready. As a photographer who approaches the day not as a series of boxes to check off but as a story unfolding, I am constantly looking for little “moments.” The crack of a smile, eyes welling up, and other micro-expressions. I think these small moments take your images from ordinary to meaningful, and the visual narrative from disjointed to rich. This is a HUGE part of what we photographers need to do our job well, that is why I always advise against hiring someone for less than 8 hours (I know I personally cannot achieve this under 8 hours.) The more time the better! More time means I will not be rushing, and I get time to relax and get in a creative head space. When I’m rushing, my mind is forced to work like a checklist I’m going down: “Photo of the dress, the shoes, the rings. Next!” With more time I get to really look at my environment and come up with a unique way to feature everything. I get more time to come up with options, and more time to observe everyone around me and understand each relationship. If you like more “candid” photography (I know I do) then here’s a little secret: that takes time to create! I have to watch and wait, and be ready to go when something awesome happens. If my mind is zooming through that check list, I just don’t have extra time for all that good stuff. I hope this has been helpful! If it still seems too overwhelming of a process, just ask your photographer to help you with it. Most will be thrilled to be asked and won’t mind putting together the first draft for you, then all you’ll have to do is tweak it. 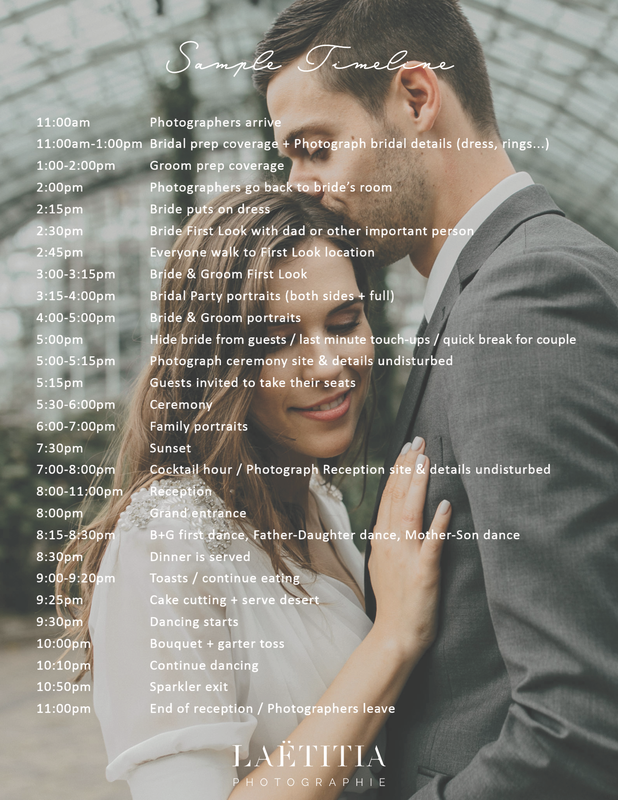 For more good advice on designing your timeline, here is a great Junebug Weddings article on it. Also see their post on Deciding Whether or Not to Have a First Look, and 8 Ways to Make Time for Yourselves in Your Wedding Day Timeline. Happy planning! Oh how I wish I had this when I was planning my wedding! We got pretty lucky that everything went smoothly for the most part, but we had timing issues with hair and makeup, and I didn’t feel like I had enough time to spend with my bridal party before pictures started! In a couple of months, I am having my brother’s wedding. And this post is really gonna help me a lot. Thanks a ton for it. Some really great advice! Especially about asking your photographer what they think of your venue options. Absolutely spot on advice and a great read! This is too perfect!! So many good tips that my clients would definitely benefit from! Thanks for this resource! Wonderful tips! It’s so helpful to plan out a wedding day schedule well in advance. It’s nice to make sure it’s well-padded, too! It makes it much easier to enjoy the day. So many good points! Love your writing too! Thank you! Currently planning my vow renewal (the wedding photographer never had a wedding lol) and definitely taking my own advice lol. very informative! i love it!